Previous Posts Shock & awe among fangs & claws or I downloaded Istaria. Being The Other Woman or Catfight In The PVP Zone... When To /Drop or The Top 5 Group Members You'd Rather Not Run With... That Ol' Bloodspatter Magic or Age of Conan Is Mailing Me Again... Aion: Runnin' in the Rift or Are the Wings Worth the Work? Well - as some of you may have noticed I've started in on the world of Istaria. Here there be dragons. In my usual charming but compulsive fashion I've drawn up some of my notes from the first 5 levels on the biped side in the hopes that other newbies have a one stop for those pesky details that can make folks weep and wail and run fleeing into the hills. I've noticed that it's not the game that makes people give up on new MMO's - it's either the community or the frustration of details that they can't fix, learn, or find a workaround for. OK - this thing is a bit nuts. It runs every time you open the game but you can set parameters using the customize button on the login box so that it does not inspect EVERY file in the game EVERY time you open the game by using the change patcher options button during the login process. --Level 1-- Invisible and Untouchable Level 1 Grulets. You'll get a quest to kill Grulets. You'll run merrily down a hill to kill them and there will be a patch of them happily grazing and oinking and make sure at level 1 you just target the level 1 lil guys to kill. If you try for level 2 or 3 your odds of dying fast are ... well..nearly 100%. If you can't find level 1 Grulets then work on the crafting side of things and try them again later. If you get too frustrated trying to find the dang level 1 piggy Grulets (this is apparently the first and number one complaint for new players lol) then head through that portal that takes you to the next step in the game and there will be a LOT of level 1 Grulets near the road heading North out of the main town. You can kill them there and then portal back to Spirit Island to turn the quest in. I'm considering a piggy relocation program to try and lure some of them back to the island but so far not even a whisper of any investors. --Level 1+-- The Trade Window. OK. The trade window. It's remarkably intuitive once you figure out what the heck is going on but there's some info that just slips by that you need to know. First off, when you click on a vendor 2 windows open up. The top window is a filter that is very very strict. It's like the worst nightmare group leader that kicks you if you loot during combat- that kind of strict. Your best bet at first is to just UNCLICK all the boxes on the filter and CLOSE IT. Don't deal with it at first until you've learned a bit more about what the game offers and what the categories mean or you'll have the lovely experience of searching and searching and finding nothing for sale in any category at any level no matter how you configure the filter lol. The filter seems to hang on to the last configuration you searched by (someone can verify this if possible - seems like it to me but I'm a newbfest) so once you unclick boxes once you can just close it in the future. I'm sure there's some box to unclick somewhere that will make the filter not show up at all but I've got enough on my plate without searching the insanely large options menus. Every npc uses this same trade window. So if you have to turn in a quest item to an npc, you'll be using this window to do so. The rest of the trade process is fairly intuitive and straightfoward - it's just the filter that is a bit eep. If you've a trade window open and you can't find anything for sale no matter what you do, just open the filter up and make sure that your boxes are either unchecked or checked correctly. That'll save you a lot of time and lower the frustration level greatly. The overhead map when you first open it up is a bit disconcerting for those used to a lotta info. It's got the land and that is it. Not even a marker for towns or landmarks :-). Calm down - hang on and stop hyperventilating. You put the markers in yourself. Yeppers - and the marker system is excellent, easy to use, and very fun lol. For example, my friend ninja'd my computer and put markers all over the map where my more spectacular deaths occurred with titles like "Tiny lil worm killded her, killded her bad!". There's some map pack out on the web that folks mentioned in chat the has the markers already in place for nearly everything in the game but I'm going commando on this one and doing without :-). Directions from the NPC's are vague and along the lines of "NorthWest of the Village" and the like. I found more by just running all over the place and mapping what I saw and then when I got quests I just looked at my map markers and voila. Most of the folks in New Player Help on Chaos were really helpful with specific coordinates and landmarks but you'll need to ramp up your navigation skills if you're used to go here quest markers and shiny lights and baubles to show you where your destination is. --Level 2+-- The Ambassador of Wit. This ferschnabbled quest was my first gah arg grrrr moment in the game. It's one of a set and for this chunk you go talk to a nice guy waaaaaay up north and he gives you a riddle. You solve it, buy the answer item from his assistant in the main village, then head back up to him in the northern frontier to turn it in - then it's lather rinse repeat. If you're having trouble with the logistics of this quest here are some clues. --If you get to his assistant and the assistant has absolutely nothing for sale make sure to open the filter and UNCHECK all the boxes or the items will not show up. --If you're at the assistant and he won't take anything you're offering to buy the answer item with, look in your inventory for a small golden coin/ball. Use that to buy the answer item - he won't take anything other than that. -I started characters on both Chaos and Order and found out that the folks were nicer on Order but there were more around in the chat on Chaos. -The young dragons are really cool. The ancient ones are intimidating lol. -Economy on both servers is great at least at lower levels. 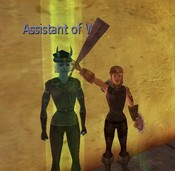 I was able to use the player trade npc to gear up easily with the funds earned from questing. That's it for now - time to get onto my regular blog article now... give a holler if you have tips or tricks of your own! I wasn't too keen on the Ambassador of Wit quest, either. Ah well. Be sure to check out the player made wiki sometime. It's got a lot of good information -- without that and the map pack, I'm not sure what I'd do!